BJP MLA T Raja Singh had made sensational remark against muslims to leave India if they don't cow or say "bharat mata ki jai". 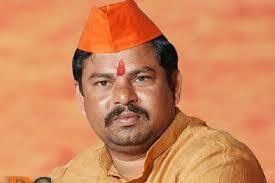 The speech was delivered in Hindu Rashtra Sammelan at Solapur. He also said that India had been a hindu dominated nation and so Ram mandir belongs to hindus only. He threatened muslims to demolished illegally made mosques and remarked that though every muslim is not a terrorist but every terrorist is a muslim.